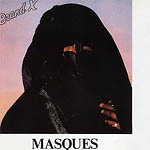 Masques is the 1978 album by Brand X. This was the band's first studio recording without drummer Phil Collins. Ironically, the rear of the album cover has a photo of the crowd from the Knebworth Festival, 1978 — a bill that included both Brand X and Genesis, Collins' other band.